Nearly four years ago today, I witnessed something dramatic, something I will remember for the rest of my life: the Colorado River flowed from its headwaters all the way to the sea. Although this doesn’t actually sound very exciting (happens all the time on other rivers), the 2014 pulse flow release to the Colorado River not only reconnected the river to the sea for the first time in 16 years, it reconnected people to their river, birds to their habitat, and the U.S. to Mexico. The flow of water was a powerful example of nations, states, non-governmental organizations (NGOs), water users, and communities coming together to restore a river and its delta, despite all odds. Today, May 12th, is International Migratory Bird Day—a great day to reflect on the immense benefits to habitat and wildlife that the pulse flow and our restoration actions have had in the Colorado River Delta. The Delta is located at a pinch point along the Pacific Flyway, a seasonal thoroughfare for neotropical migratory birds including many songbirds, shorebirds, raptors, and waterfowl species. Nestled within an extremely arid region, habitat in the Delta provides a critical stopover and refueling point for migratory birds—the same exact birds you might see in your backyard or out on a hike somewhere in the western U.S.! 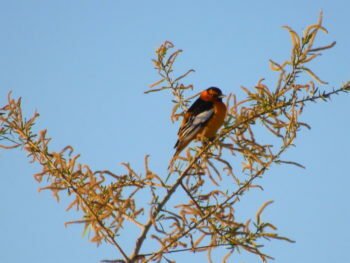 Some of my favorite birds, like the western tanager, yellow warbler, Swainson’s hawk, cinnamon teal, and the American avocet, all benefit from habitat in the Colorado River Delta. Fortunately, Sonoran Institute and its partners in a bi-national coalition of environmental organizations called Raise the River have been working for the past 20 years to bring water back to the Delta and restore diverse habitats; evidently, the birds like what we’ve been doing. In direct response to the pulse flow, migratory waterbird abundance in the Delta was four times higher in 2014 than the previous year and was the highest ever recorded since the start of the surveys in 2002 by our partner, Pronatura Noroeste. Beyond the immediate response to water as evidenced by waterbird species, overall bird abundance and diversity are on average nearly 50 percent higher in our restoration sites than in other areas along the Colorado River in Mexico. 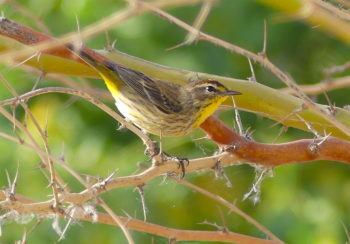 At the Las Arenitas wastewater treatment wetland, a project Sonoran Institute has been working on since 2008, the number of bird species went from eight to more than 160 species in just over five years, with a maximum bird count of 18,000 birds! Our restoration sites provide not only diverse habitat types and structure—open water, marsh, riparian, mesquite bosque, and mudflats—but they also provide a food source for many birds. Last fall, I heard the ka-ka-ka-kow-kow-kowlp-kowlp of a yellow-billed cuckoo in Sonoran Institute’s Laguna Grande restoration site, the largest swath of riparian habitat on the Colorado River in Mexico. The western yellow billed-cuckoo, an endangered species in many Western states, was stopping by for a bite to eat and a rest before continuing its journey south to a warmer place for the winter. Although the cuckoos aren’t yet using the site to nest, they now know it’s there; I’m confident that it’s only a matter of time. As Sonoran Institute and partners continue to provide water and expand restoration efforts in the Delta, we continue to rebuild bird and other wildlife populations that have long been in decline due to extensive reduction of riparian and wetland habitat in western North America. Beavers, bobcats, coyotes, snakes, lizards, and monarch butterflies are some of the other critters that now frequent our restoration sites. Beyond the wildlife, we are also rebuilding human communities’ connection to habitats in the Delta by involving local folks in restoration activities and providing recreational and eco-tourism opportunities in restored areas. Restoring the Colorado River Delta is vital to wildlife and people on both sides of the border. For me personally, restoring the Delta is also a way to give back to the river upon which our communities, economies, and ways of life are so heavily dependent. Viva el Delta del Río Colorado!